If you’ve been following for a while, you will come to learn that I’m a fan of two investing strategies, index investing (buying the broad market with low fee ETFs/mutual funds) and income producing dividend growth investing. I like index investing for its ease, low cost, and ability to beat most active mutual fund returns over the long term. I use this strategy for: my spouse’s RRSP; the international portion of my RRSP; and, the education fund that I setup for my two kids. Dividend growth investing is another beast. Although, if executed correctly has the potential for long term market beating returns, I’m really in it for the income. There’s something about the idea of owning a piece of the very best companies out there, being paid to own them with annual raises, and using very little effort on my part. It really is the definition of passive income. The cherry on the cake is that Canadian dividends get preferential tax treatment (for now). A reader question that I often get is “what dividend stocks should I buy?” I tend to cringe a little at that question because I believe in picking dividend stocks as part of an overall dividend portfolio, rather than buying a couple stocks for a big win. Sector Diversification – Since a large portion of our portfolio is Canadian based, I try to diversify by picking dividend stocks by sector. Some use broader sectors, I tend to use: telecom; pipelines; financials; resources and materials; utilities; health care; consumer; industrials; real estate; and, technology. Dividend Growth History – As previously mentioned, I follow the dividend growth investing strategy, which means that I tend to choose dividend stocks that have a history increasing their dividend annually. Earnings History – Even with a solid dividend growth history, a safe bet is to make sure that their earnings are growing with the same trend as well. It may be a warning flag if earnings are decreasing while dividends are increasing. It may only be a matter of time before dividends will need to be reduced, or worse, eliminated. Yield above 2% (but high yields may be a a warning) – As my plan is to eventually live off dividends one day, I prefer to be rewarded with a yield that is higher than 2%. Ideally, the yield would be greater than 2.5% but less than 6%. Why not the higher yield? Generally speaking, if a dividend stock averages in the 3% range over the long term, but then spikes to over 6%, it could be an indication of a dividend cut coming as high yields can be unsustainable. On the other hand, it could also mean that it’s oversold and a value play. It really depends on the situation which means that more research into the company is warranted. Market Cap – My core dividend positions are generally larger market cap companies (ie. big company) with a long history of dividend increases and a long term competitive advantage. Here are some of my favorite dividend stocks sorted by sector. Note that these are not recommendations and should be used for informational purposes only. Also note that this portfolio has a Canadian bias, so if you need more diversification, you’ll need to pick up more US and international positions. Personally, I typically use an ETF for international exposure. One more thing, not all of the positions below perfectly fit the criteria that I listed previously. So best to use this list as a starting point for your research. Telecom – BCE (BCE), Telus (T), Rogers (RCI.B), AT&T (US:T), Verizon (US: VZ). Pipelines – Enbridge (ENB), TransCanada Corp (TRP). Financials – Any of the big banks: Royal Bank (RY), Toronto Dominion Bank (TD), Scotia Bank (BNS), Bank of Montreal (BMO), CIBC (CM); Insurance: Manulife (MFC), Great-West Life (GWO), Sunlife (SLF). Resources and Materials – Suncor (SU), Agrium (AGU), Exxon (US: XOM), Chevron (US: CVX). Utilities – Fortis (FTS), Canadian Utilities (CU), Emera (EMA), Brookfield Infrasturcture Partners (BIP.UN). Health Care – Johnson and Johnson (US: JNJ), AbbVie (US: ABBV), Cardinal Health (US: CAH). Consumer – Empire (EMP.A), Loblaws (L), Walmart (US: WMT), Procter and Gamble (US: PG). Industrials – Canadian Pacific Railway (CP), Canadian National Railway (CNR), Finning International (FTT), Emerson Electric (US: EMR). Technology – Microsoft (US: MSFT), Intel (US: INTC), Apple (US: AAPL). Real Estate – Riocan (REI.UN), Canadian Real Estate Trust (REF.UN), Smart REIT (SRU.UN). If you are interested in my personal positions, you can see some of my top dividend holdings here. If you are interested in dividend investing, but not interested in picking individual stocks, then the next best thing is to own a dividend ETF. The only downside with owning Canadian based dividend ETFs is that you may get a concentration in a particular sector, like financials in Canada. Since that article, PowerShares released a dividend ETF, that is quite attractive – trading symbol PDC. It tracks the NASDAQ Select Canadian Dividend Index, and charges a MER of 0.50% which unfortunately is a bit on the high side. What I like about this ETF is that is has less exposure to financials than others and it includes real estate exposure via real estate investment trusts (REITs). If you want to go the ETF route, I would highly suggest that you visit their respective websites to see the sector exposure that you are getting. Most of them will have very little real estate exposure, so you may want to add a REIT or two depending on your existing real estate exposure. More on this below. I’ve written about REITs in the past and holding some of the larger Canadian names in my TFSA for quite some time. Although REITs generally have a higher than average distribution yield, they are not known to have an increasing annual dividend. The exception being Canadian Real Estate Investment Trust (REF.UN) which has a respectable 15 year streak. To me though, these REITs charge quite a bit for very few holdings. For example, XRE has 16 holdings with VRE/ZRE not much better with 19 holdings. The top 10 holdings of each of these ETFs make up about 75% of the entire ETF. Personally, I would prefer to pay 0% MER and get semi-close tracking of the REIT index by owning the top 5 holdings – REI.UN; HR.UN; CAR.UN; SRU.UN; and, REF.UN. Owning these positions will give you about 55% of the REIT index. There you have it, a summary of how I pick dividend stocks and a listing of current favorites by sector. This should give you a general idea on where to start when looking for quality dividend names in Canada and even a few positions in the US. As another disclaimer, I own a number of positions mentioned in this article. Great post, dividends can really bring a nice cashflow. On my side, I am looking to get ZDV and ZRE in my portfolio. I’ve also added a risky one the FIE etf just for fun. It is not that Fie is risky, but more that it is paying you a greater dividend that the securities within the etf payout, thus you are getting a return of your own capital each month. Would you care to explain the “return of your own capital” each month… Seems to me that, after a while, you’d be left with zero shares since your capital would have been completely returned to you. How can that be ? Thanks for the excellent post. The only thing I would add is that for many investors, especially those that are just starting out, achieving the diversification that is necessary to bring risk levels to reasonable level can require a lot of transaction fees. A lower fee ETF such as VDY can be an excellent place to start (and remain for most). And while you are still building your nest egg and don’t need the regular cash flow you can set up a DRIP to reinvest the dividends (which further reduces transaction fees). Example would be Saputo (SAP) and Royal Bank (RY), or Metro (MRU) and Enbridge (ENB), CNR or Atco (ACO.X) and Suncor (SU). This way the majority of the stocks are always raising their dividends, but even yields under 2% can be very helpful IF they are raising them at double digits. The balance really helps to accelerate the income growth, which allows you to buy more dividends stocks, which compounds into more dividends. Thanks for stopping by Brad. What are your favorite low yield divvy growth stocks? I’m here often, just taking a passive glance! The strategy (40/40 high/low) has helped me achieve around a 9.5% increase in dividends every year depending on the phase of the cycle we are in. 2008-2010 did not yield an increase like that, but I was fortunate to get around 5% overall (income) during that time period. In the US Hormel Foods (HRL) has always been on of the leaders in my portfolio like this too. Any thoughts on the impact from rising rates on dividend paying stocks, especially given valuation? At this stage, if you were starting out, would you look elsewhere for income? If so, where? That is a great article for beginning dividend investors. I am really enjoying reading about your transformation into a dividend growth investor. The one thing about ETF’s is that these fees seem very high. Wouldn’t it be cheaper for someone to just replicate them directly by paying a one-time brokerage cost, and then letting it alone? US index fund and an international index fund and keep things simple? Apx what would my fees be there if I did this? Also what index fund do you reccoemnd for Canada dividend equities that is simple? Thanks for any help to anyone in this chat? Elizabeth, it’s different strokes for different folks, depending on your experience of investing outside of GIC’s or when it’s in the hands of an investment advisor, to what is your ultimate goal to age 65. It also depends on the individual person, their age, lifestyle, income while working, children/grandkids and what they are trying to achieve. There is no such thing as a sprint to the finish line with a quick growth investing, investing is a marathon, one step at a time making sure that you don’t trip so that you cannot pick yourself up. You can read books, blogs like this one where folks have different views on what to invest in. Most successes seem to be long steady growth from dividend paying stocks and reinvesting the dividends. As to which equities, well that’s the million dollar question. With $250k in an RRSP, my guess is that you want that invested as safe and sound as possible, growing 3% per year & compounding for the next 12 years? Maybe 1% – 2% per year return secured investment in the bank is best. You will get suggestions from blue chip dividends stocks and whatever else is out there. There is no straight forward answer, as there is no predicting which way any investment in the stock market will go. Thanks John for your feedback. Ok- I have read a little more and am still trying to figure our what to do with our $250k RRSP. Right now it is in a TD balanced and some in the TD tactical Mutaul funds with ridiculous 2.4% in MERs & scare tatics from TD guy that that MER pays for expert advice on how to grow our money and prepare for retirement. From the reading, I have been doing lately, I am leaning towards investing this RRSP into a Drip Dividend portfolio strategy similar to FTs strategy. Thoughts? I have set up a self driected TD account but I am still waiting to understand if this is a best strategy. I am not into “get rich quick” I just want our money to grow at better rate than currently and I would like our investment to eventually provide our income for when we reach mid 60’s. I will have more money to invest when we sell our home ( apx $600K) plus I have some investments my company’s pension plan where the have matched my contributions up to 4% ever year. Hoping some people can guide me. Thank you- fabulous forum! Any thoughts on the Tangerine Dividend Portfolio? Admittedly, the fees (MER 1.07%) are higher than ETFs, but it seems like a nice, easy all in one option for beginners. I haven’t posted in years but have followed this blog on and off for years. Thank you and congrats to everyone. I have the majority of my net worth and assets in real estate, which produces good rental income, moderate cash flow and debt pay down. I do have RRSP and RESP portfolios (slightly over $500k) but would like to have a dedicated dividend portfolio and dividend stream to augment my rental income. 1) Would you put a chunk of money in now or would you put a chunk in now and do monthly contributions? 2) What do people thinking about putting on some mild leverage on it so I can write off the interest? I think in FT other articles he likes to use the home CL to fund. bruce, studies show that lump sum investing is best, but personally, I would have a hard time dumping it into this bull market (currently in year 8). I would only go for leverage if you can tolerate the volatility that comes with the stock market. 2) how often to contribute to this portfolio, and how. for example – automatic withdrawals? 3) how to track it in Excel and what specific columns you put in? Cost base? dividends, dividend yield %, current price? A few answers to your questions … all just my opinion! 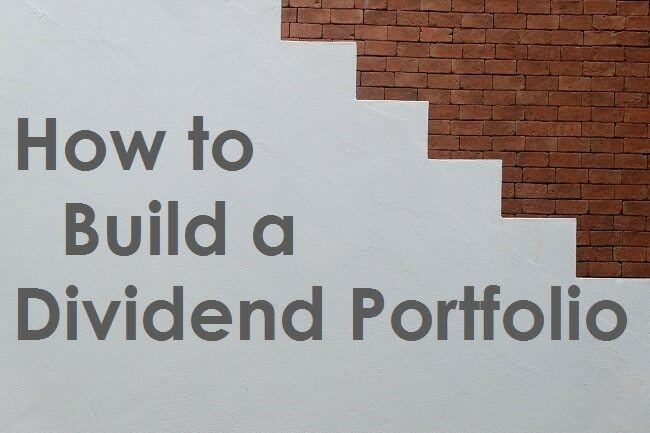 1) to start a new dividend portfolio, you need to set up an online brokerage account. There are many to choose from. I am a Canadian, so I use RBC Direct Investing, but you would be fine with any of the large ones. Once you have it set up and funded, I would argue that 8-15 stocks you mentioned would be a great start. Over time, however I am firm believer you should build out your portfolio so no particular stock is > than a 5% weighting – this means about 20 stocks at a minimum. 2) This one is subjective. The answer is: you should contribute as often and as much as you can afford! The magic sauce here is consistency. Be consistent with putting money away and you’ll be way ahead in the end. 3) You nailed this one… an excel tracker doesn’t need to be complicated! Simple things to track, as you mentioned are things like shares owned, current price, market value, dividends per share, dividend yield, adjusted cost base, and cash balances. There isn’t too much more that you need in my opinion, but I would recommend reading up on tracking adjusted cost bases, in particular, especially if you are investing in taxable accounts. Hi. I am presently a passive investor using Vanguards VGRO. I like the idea of dividend investing but leaning towards adding a dividend mutual fund to my portfolio rather than an ETF or actual dividend stock. I just want to be simple. Are there any dividend mutual funds that stick out for you? Perhaps Beutel Goodman Canadian Dividend (BTG 875) which has international exposure or RBC Canadian Dividend (RBF 1014) which is more domestic. Thanks for your suggestions. John I’m not too familiar with the dividend mutual fund scene , I’ll take a look around . Why not an ETF ? Hi. Thanks for the response. Some of the dividend mutual funds that I have suggested have outperformed many of the Dividend ETFs at the 5, 10 and 15 year mark. At least that is my interpretation….could be wrong! I’m also looking for something in a non registered / cash portfolio and don’t necessarily want to do calculations such as Adjusted Cost Base for Dividend ETF’s. Just too complicated for me. These figures / adjustments are completed by the mutual fund companies (and a tax form is generated), but not necessarily so for ETFs. Again, I am talking about non registered accounts. I just want something simple. Thanks for the kind feedback John! i am threatened with well it may not be going up but it is not going down. Hi FT, for those who do not want to manage their own investments, there is that Tangerine Dividend Portfolio. While the fees are at 1.07% that might be good value for those who want a managed portfolio. It tracks the MSCI Indices in Canada, US and International. Those indices have beat the underlying parent index (over longer periods) in Canada, US and International. That largest beat is in Canada, largely thanks to those big Canadian banks. One can google to find the fund fact sheets. Eg MSCI Canada High Dividend Index. MSCI US High… etc. Thanks FT, but most do want to need a managed portfolio. As you likely know, it’s more than difficult to get many Canadians to make that leap to self directing. There are some massive barriers. I am more in favour of index skimming and removing the fees altogether, ha. It does not take many to replicate an index. But that would likely even scare most index investors. There are many advantages to individual stock portfolios beyond the fees. My circuitous route was individual stocks to index ETFs and back to stocks by way of skimming. Ha.